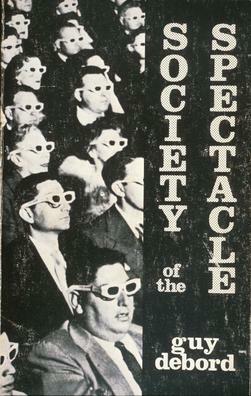 Back in 1967, Guy Debord, a French Marxist theorist, released a fairly brief but very powerful work called the “The Society of the Spectacle“, which brought together much of the work of the Situationist International. Debord touches on many themes in this work (it’s well worth reading) but he focuses on the degradation of human life, the influence of mass media and our commodity culture, and then (unsurprisingly for a Marxist) draws on the parallels between religion and marketing. I’m going to write three more paragraphs on the Spectacle itself and then get to the education stuff. Hang in there! Ultimately, the Spectacle is self-sustaining and participating in a version of the world that is manipulated and second-hand will only produce more experiences that are in line with what has already been experienced. And why shouldn’t it? The entire point is that everything is presented as if it is the right thing to do and, by working within this system, that your own interactions are good because they are also within the Spectacle. However, this can be quite alienating, especially for radical or creative thought. Enter the situation, where you construct authentic, creative ways to liberate yourself from the Spectacle. This is where you are actually creating, making, doing something beyond the relationship of yourself to things you buy: this interactions with people beyond the mediation of established systems and commodity fetishism. Ok, ok, enough of the details of Debord! I’ll get to my point on education. Let’s take a simplistic view and talk about the presentation of second-hand experiences with little participation and official sanction. I don’t know about you but that sounds a lot like the traditional lecturing style to me – high power-distance and low participation. Hierarchical enforcement and the weight of history, combined with a strong bureaucracy. Yup. That sounds like the Spectacle. When we talk about engagement we often don’t go to the opposite end and discuss the problem of alienation. Educational culture can be frightening and alienating for people who aren’t used to it but, even when you are within it, aspects will continue to leap out and pit the individual (student or teacher) against the needs of the system itself (we must do this because that’s how it works). So what can we do? Well, the Situationists valued play, freedom and critical thinking. They had a political agenda that I won’t address here (you can read about it in many places) – I’m going to look at ways to reduce alienation, increase creativity and increase exploration. In fact, we’ve already done this when we talk about active learning, collaborative learning and getting students to value each other as sources of knowledge as well as their teachers. But we can go further. While many people wonder how students can invest vast amounts of energy into some projects and not others, bringing the ability to play into the equation makes a significant difference and it goes hand-in-hand with freedom. But this means giving students the time, the space, the skills and the associated activities that will encourage this kind of exploration. (We’ve been doing this in my school with open-ended, self-selected creative assignments where we can. Still working on how we can scale it) But the principle of exploration is one that we can explore across curricula, schools, and all aspects of society. It’s interesting. So many people seem to complain about student limitations when they encounter new situations (there’s that word again) yet place students into a passive Spectacle where the experience is often worse than second-hand. When I read a text book, I am reading the words of someone who has the knowledge rather than necessarily creating it for myself. If I have someone reading those words to me from the front of a lecture theatre then I’m not only rigidly locked into a conforming position, bound to listen, but I’m having something that’s closer to a third-hand experience. When you’re really into something, you climb all over it and explore it. Your passion drives your interest and it is your ability to play with the elements, turn them around, mash them up and actually create something is a very good indicator of how well you are working with that knowledge. Getting students to rewrite the classic “Hello World” program is a waste of time. Getting students to work out how to take the picture of their choice and create something new is valuable. The Spectacle is not what we want in higher education or education at all because it is limiting, dull, and, above all, boring. I really like this. I think it articulates what I have tried to do with my real world projects (https://computeitsimple.wordpress.com/2014/12/03/what-makes-a-successful-real-project/). When it works, the kids absolutely fly. The challenge is that not all kids respond, and I’m still trying to work out whether there is a kind of preparation (or a different kind of project, maybe) that would engage these kids, or whether they need something else entirely. The ones who fly can be from either end of the skill spectrum, or anywhere in between. I wonder if there’s something that works for all of them?